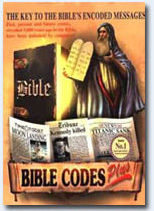 Our best Bible program ever, includes all the features that made Bible Codes Plus (BC2000) such a success, plus many new, unique, and powerful features that will give you new insights, such as specified marked area for automatic statistical analysis; automatic report generator; verse retrieval by eight different methods; gematria exegesis by eight different methods including a unique user specified value; Bible chronology; automatically going to the Torah portion of the week; the 613 Torah commandments of Maimonides keyed to the biblical text; verse by verse Torah commentaries by Rashi; the greatest of the medieval exegetes; letter substitution; (JeremiahРІР‚в„ўs encoding method); and much more. Search the Bible without any knowledge of Hebrew for encoded events and names. including your own and your families! Past, present and future events, encoded 3,000 years ago in the Bible Can now be decoded by computer! An ancient tradition states that God dictated the first five books of the Bible - the Torah - to Moses, in a precise letter by letter sequence, Which encodes historic facts, past, present and future. Method which uses the numerical value of the Hebrew letters to find and compare with other words or verses, has been used since the time of the Second Temple to derive insights into the sacred writings, to obtain interpretations of the text, or to illustrate a secular matter. For example, in Genesis it is written: And when Abram heard that his kinsman was taken captive, he armed his disciples who had been born in his house - three hundred and eighteen - and he pursued them as far as Dan, (Genesis 14:14). 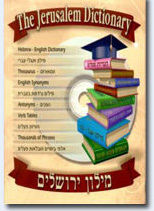 Dictionary-thesaurus tool for non-Hebrew speaking users that helps you to find and identify the translation closest to your meaning The best bilingual dictionary-thesaurus English to Hebrew - Hebrew to English, The ideal Bible Codes companion program for non-Hebrew speaking users. 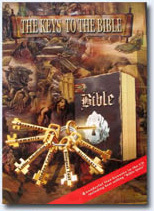 With this program you will understand the Bible better and more accurately! This unique, informative and comprehensive software brings in narrative format the biographies of over 3,000 persons named in the Bible, sorted by alphabet, date and text location. It is the most complete and detailed reference tool on the subject. It tells the individual story of every person named in the Bible. A Program for the Whole Family! Learn modern and Biblical Hebrew for all ages with the friendliest multimedia. Fully animated, slowly speaking program for the whole family. Introducing Hebrew World - the newest, hottest CD-ROM on the market. Utilizing advanced phonetic concepts, this interactive program is ideal for children,yet sophisticated enough for the US embassy staff in Tel Aviv. 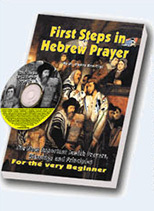 Learn Jewish prayer for beginners with the friendliest prayer tutorial. Hear every prayer and blessing on the enclosed CD. See text in English, Hebrew and transliteration. A Book and a CD or Tape Together! This best-seller beautiful book provides an easy and pleasant start with the first steps of Jewish prayer, bringing to you the most important prayers and blessings. Only a few years after being published, over 40,000 pastors, Bible teachers and other individuals across the country are using this book, and this number is growing rapidly. 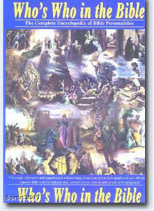 It is now rewritten and beautifully illustrated so that every layman Christian can understand, enjoy and treasure. 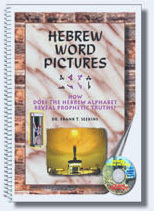 "Hebrew Word Pictures" is a wonderful enrichment to anyone who loves the Bible. In just a few short hours learn how to read and write Hebrew. This clear and straightforward workbook has been specially created for English speakers with absolutely no knowledge of Hebrew. Click below to hear the narration of the Hebrew Alphabet in Israeli accent. On the actual CD the reading speed is, of course, much slower. The Law, The Prophets, The Writings. (Torah, Neveeim, Ktuvim). The best Hebrew narration ever of Hebrew Scriptures recorded with excellent intonation, diction, and accent. Each one of these Hebrew recordings was broadcast on Kol Israel, a chapter every night. 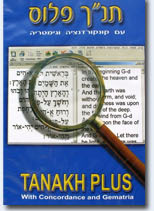 These CDs can dramatically improve your Torah reading and understanding of the Hebrew Bible. 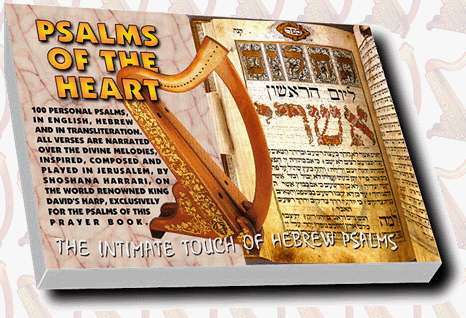 Now, you too can pray the psalms of King David, saying the very words he wrote, spoke and sang in Leshon Hakodesh (the Holy tongue) - Hebrew. While you listen to the words, whether to practice, meditate or to solemnly pray, you'll also hear the heavenly music of King David's harp.